Left to right areWillie Smith, representing Alleghany Mountain Radio and Alan Hicks, WestRock communications analyst. 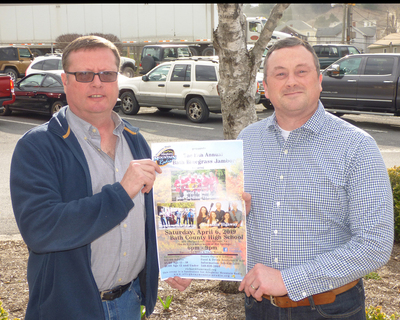 Covington, VA (April 3, 2019) - April 3, 2019– The Covington mill recently presented a donation to Alleghany Mountain Radio in support of the Bluegrass Jamboree, which is scheduled for April 6, at Bath County High School from 6 – 9 pm. The concert will feature David Parmley and Cardinal Tradition, Southern Rail Express, and Mountain Highway. Food and drink will be available starting at 4:30 pm, and the doors will open at 5 pm. Tickets are $12 for adults, $5 for youth age 13 – 18, and $1 for age 12 and under.